There are several brands of spinning wheel on the market today. Although they have different names, they basically follow the traditional styles of spinning wheel from the past. The Saxony wheel is the most popular style of wheel for beginners, while the Great Wheel is generating new interest from advanced handspinners. The upright wheel, known as the castle wheel is a popular choice for spinners who want to be able to transport their wheel. There are also models that fold up for traveling. Avoid choosing a spinning wheel just because of the way it looks, without first understanding its working capabilities. Many factors should be considered when selecting a spinning wheel. Here are a few of the traditional styles for spinning wheel. The most commonly known version of the spindle wheel, is the Great Wheel. The spindle wheel played an important role in the development of yarn and wool spinning for several years. It was designed specifically as a devise to rotate the spindle, which had been previously been done by hand. 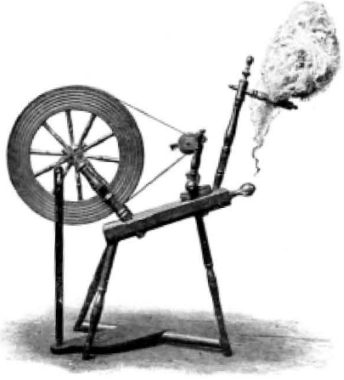 The Spindle wheel was used to spin fine fibers, like cotton and silk, into thin thread and yarn. The common spinning (flyer) wheel styles are classified as; saxony wheel, castle wheel, Norwegian wheel or the modern wheel. When most people think of spinning wheel, the saxony style is the most familiar. It is often referred to as the "Cinderella" wheel. The elements of a saxony wheel are arranged horizontally, with a large wheel at one end and the flyer at the other, and normally have three legs. The Ashford Traditional and Elizabeth wheel are good examples of the saxony wheel. The component parts of a castle style wheel are stacked vertically with the flyer being positioned above the wheel. Good examples are the Ashford Traveller, and Majacraft wheel. The Norwegian wheel looks similar to the saxony wheel. It usually has a large wheel and four legs, and a horizontal bench. Kromski manufactures a Norwegian style wheel. The modern wheels take advantage of technology for enhancing performance and have a more advant-garde appearance. Examples of modern wheels are Louet wheels and the Ashford Joy. The Charkha wheel gained popularity in India, by Mahatma Gandhi, because of its practical use for spinning cotton, and its portrayal of economic independence. It is still being used in parts of India today. The box style is one variation of the Charkha wheel. It is small, very compact, and it folds up into a box that can be easily transported. The method used for spinning on a Charkha wheel is similar to spinning on the Great Wheel. The spinner sits on the ground and rotates the wheel with one hand while drafting the fiber with the other hand. 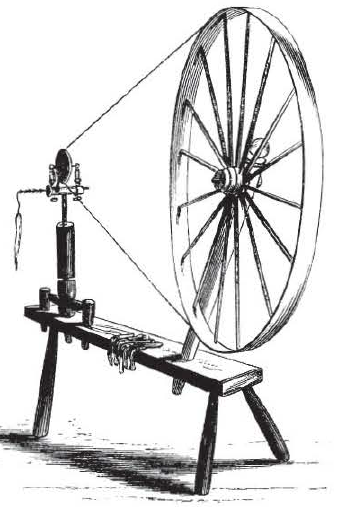 The Charkha wheel is ideal for spinning very fine fibers like cotton, silk, angora, and cashmere. If you have any questions or problems getting started, please contact us.